Houndstongue contains pyrrolizidine alkaloids. Horses and cattle are most susceptible to poisoning from these alkaloids, while sheep for some reason are relatively tolerant of the alkaloids. The alkaloids in houndstongue has a cumulative effect on the liver and pretty much will induce fatal poisoning once 5 - 10 % of an animal's body weight in green plant has been consumed over a period. Death from houndstongue poisoning is due to severe, irreversible liver failure. 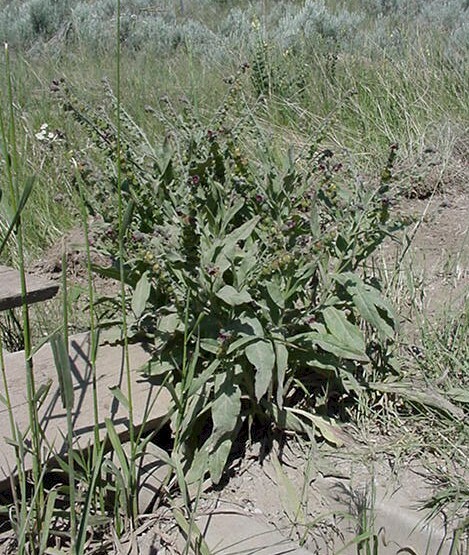 This poisoning often occurs in horse pastures when the plant is abundant or adequate forage is not available. It is potentially toxic when it is mixed with hay. Some signs of poisoning include weight loss, jaundice of the skin and mucous membranes, and photosensitivity of non pigmented skin. Additional signs of pyrrolizidine alkaloid poisoning may be rough hair coat, depression, diarrhea and abdominal discomfort due to the presence of large quantities of fluid in the abdomen. As the disease progresses some horses may develop signs of head pressing, excessive yawing, and constant aimless walking because of the accumulation and action of toxic metabolites on the brain caused by the liver's inability to detoxify these toxic compounds. You can not stop the effects of houndstongue on the liver. There is no specific treatment for the disease. Once signs of liver failure and photosensitivity are apparent, the animal's chances for recovery are very unlikely. Some ways to improve the animal's condition can be done by putting the animal in a dark stall to prevent photo sensitization. In some cases feeding a diet high in energy has been beneficial. Often herbicides increase the palatability of plants by effecting the sugar content. So, make sure you are cautious when grazing livestock after herbicide application. For example, avoid grazing treated areas until plants have dried. Make sure you don't over graze because that's when houndstongue is able to take over. Keep irrigation and make sure that you keep lots of healthy grasses/forbs in your fields. You may also mow the area because this puts stress on the plant and drastically reduces the seed production by 60%. However, mow before the houndstongue has bloomed. Another plant management method is using herbicides. Houndstongue produces a prolific seed and they are spread by there ability to stick to other animals. To brake the cycle of the plant physically remove the plant at flowering or in early seed formation. You can pull or dig these weeds out which will also break the cycle. Be sure to bag and destroy the plant so seeds do not mature on it after you pull it. Burning is not an effective method of controlling these weeds at this time. There is no effective control at this time. Insects are not an effective method of controlling these weeds at this time in the United States. An insect should be approved for release soon in the US. That insect is established in Canada and seems to be working. There are some herbicides that are known to be effective on houndstongue such as Tordon (picloram), Banvel (dicamba) or 2, 4-D. You want to apply herbicides during the pre-bud stage or in the rosette stage. 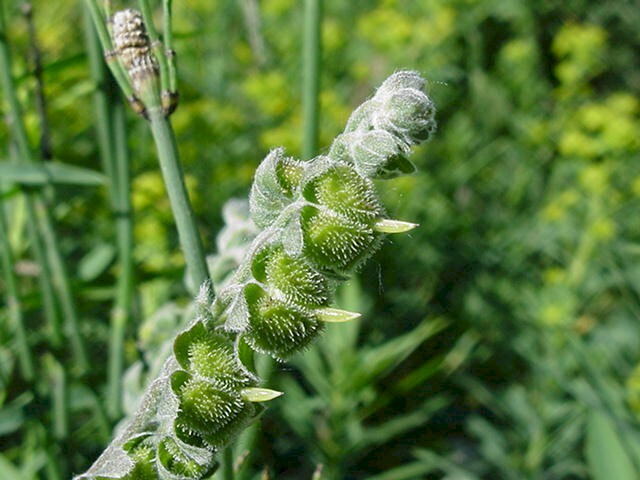 Pre-bud occurs in the spring or early summer and the rosettes form in late summer and early fall. Surfactants (a surface-active substance) are recommended because of the hairiness of the leaf. By Kyle Dosland. 3/01. Updated by Vince T., WHS student, 3-22-06.